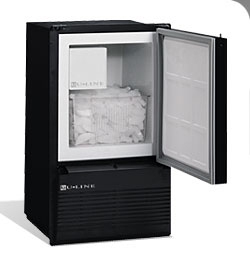 U-Line | Ocean Options, Inc.
High performance along with energy efficiency and custom styling are the defining features of the U-Line family of ice makes. 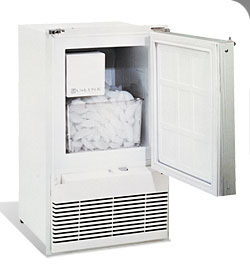 As developer and manufacturer of the world's first built-in undercounter ice maker, U-line has always been at the forefront of the industry. 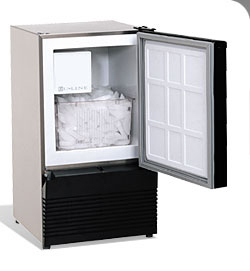 There are more U-Line ice makers onboard boats than any other brand of ice maker in the world. 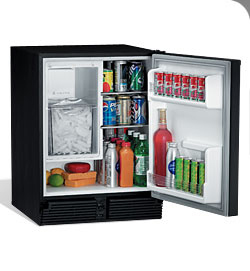 The manual defrost Combo Ice/Refrigerator model combines maximum ice production with the performance of a high efficiency refrigeration system - all in one compact unit. 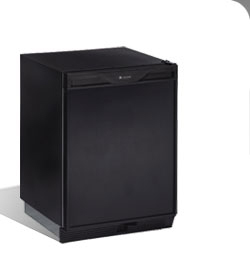 Maximize your use of space by having both an 18 pund ice maker and 2.1 cubic feet of refrigeration capacity in a single unit. The black unit is designed with marine applicatons in mind, featuring a field reversible door with an integrated handle, factory installed travel pin, stainless hinges and mounting hardware. The door also accepts a custom panel to match surrounding cabinets. 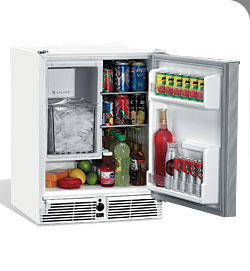 This white unit, designed specifically for marine applications features a field reversible door with an anodized aluminum door handle and frame that is corrosion and UV resistant. It also features a factory installed travel pin, stainless hinges and mounting hardware. 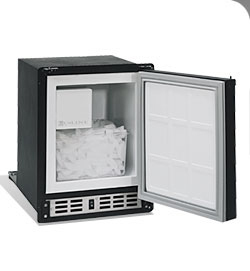 This freezer unit available in black or white features a manual defrost, 5.7 cubic feet freezer capacity, and adjustable in-door storage for convenient access and increased capacity.